Specialtab.com enters in your PC using third-party software and then it hijacks the settings of the browsers. It tracks your online activity like browsing and search history. Here is how to remove Specialtab.com? Specialtab.com is a browser hijacker, it hijacks the settings of all your browsers. It targets popular browsers like Google Chrome, Mozilla Firefox, Microsoft Edge, and Internet Explorer. Once it enters in your PC it hijacks the settings of browsers like homepage, new tab, and default search engine. The hijacker replaces the URLs of these fields and doesn’t let you change them. Specialtab.com pretends like a genuine search engine but when you search something, it redirects you to Yahoo search engine for results. No genuine search engine does that. The purpose of this hijacker is to spy on you and serve malicious advertisements. It tracks your online activity, it records your browsing history, search history, IP address, Geo-location, OS & Browser version, and even some hardware information. The browser hijackers usually spread using software bundling method. Various software downloading websites on the internet bundles it with their popular downloads. When you download and install that software on your PC, you also install the hijacker. If you choose the custom installation method you could see the preselected hijacker. You can deselect it from there. However, it is advised to not install software from untrusted sources. If you have to install a free software then only download it from the official website. To remove Specialtab.com, download MalwareFox Anti-Malware. This tool is effective in getting rid of Trojans, viruses and malware. To make sure that no more malicious files linked to Specialtab.com are inside the computer, we must run another effective scanner. This time, use Junkware Removal Tool. No installation is necessary with this tool. 6. After scanning the computer, JRT will open a Notepad containing scan logs. It may have not find Specialtab.com relevant entities, but it will surely delete any malicious items not found in the previous scans. 4. At the bottom of the page, click on Reset settings to remove all changes made by Specialtab.com. 4. In order to reverse modifications caused by Specialtab.com, click on Reset button to bring back Internet Explorer's settings to their default condition. 3. Click on Refresh Firefox button to erase the effect of Specialtab.com. 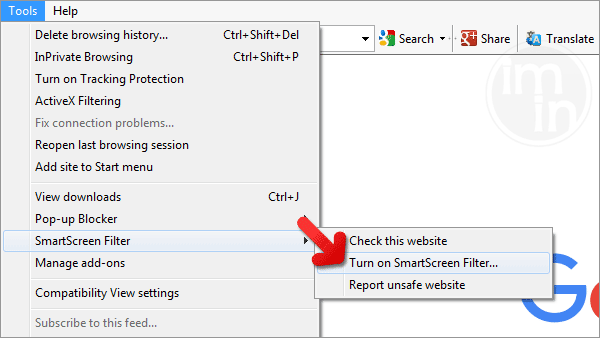 SmartScreen filter is a built-in feature in Microsoft Edge browser that can help you deter malicious programs such as Specialtab.com. It can block malicious web sites and downloads.